The buzz has been deafening since the news first broke that three Chez Panisse alums would be opening a noodle shop that fused Japanese tradition with the market-driven approach that Bay Area cuisine is known for: ramen topped with seasonal ingredients like Meyer lemon and Dungeness crab — whatever is best and freshest on a given day. While the labor-intensive soup bases aren’t strictly traditional, each bowl of ramen is marked by the precision and obsessive attention to detail that is the hallmark of Japanese cooking. 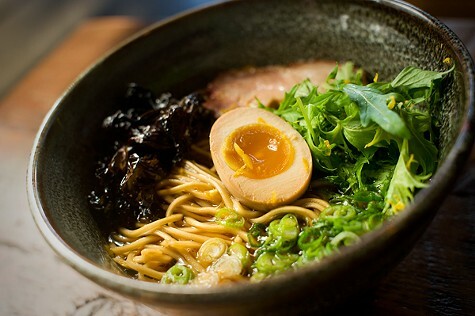 The noodles are always springy; the spit-roasted chashu pork is tender and unctuous; and each soft-boiled egg has a bright-orange yolk with just the right consistency. Meanwhile, some of the most memorable items are the non-ramen dishes: a halibut tartare salad that was a study in bright, clean flavors; a wonderfully varied pickle plate; and intensely aromatic fried rice featuring shrimp and wild nettles. For those chilly July and August days in Oakland and beyond.